ST. RAPHAEL’S — The Bishop’s House at St. Raphael’s will be the site of a Dry Stone Walling Workshop on the weekend. 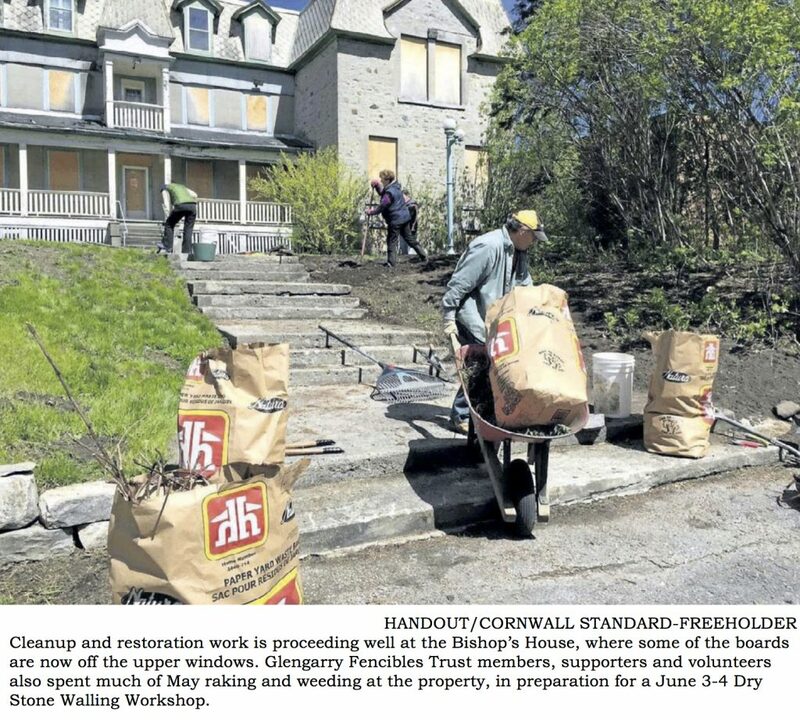 The workshop’s focus will be on the application of drystone walling principles for the preservation of historic stone walls, and it will also contribute to the reparation of the 1826 retaining wall in the Bishop’s college garden. “It’s a win-win,” said Brenda Baxter, president of the Glengarry Fencibles Trust charitable group that’s hosting the event, being presented by the Dry Stone Walling Association of Canada. The association’s Scott Young will be the instructor, and six volunteers will also make the trip to St. Raphael’s – which was declared a national historic site in 1996 – to work on the wall. The Fencibles Trust group acquired the Bishop’s House a year-and-a-half ago after helping to save it from demolition in 2015. The most recent fundraising campaign and appeal to donors and supporters resulted in $250,000 being raised for more restorative work to be done, and a Parks Canada cost-sharing grant means a proposed $500,000 in additional restoration can go forward once approved. In the meantime, a community effort has the site looking very spiffy. “(Fencibles Trust members) have been busy cleaning up the property in preparation for the dry stone workshop – all with the help of many kind supporters,” Baxter said. Baxter spoke of one group which frequently helped out in May as an example, raking, weeding, and wrestling with stubborn lilac roots that were encroaching on the front steps. “As a result, more and more of the house is now visible from County Road 18,” she said. But that meant a stone supply issue – ultimately one solved by Cory VanSleeuwen, of the Williamstown area. Baxter noted that one of VanSleeuwen’s farms north of the village has the old MacGregor quarry on it, where rock exposed for years on the side of the quarry itself was found. “He then used machinery to gather the stones, and he hauled them all to a location near the house,” Baxter noted. “He did all of this for the benefit of the dry stone wall, and at no cost to the trust. The Bishop’s House was built in 1808 and is the former home of the first Ontario Catholic bishop, Alexander Macdonell. The DryStone Walling Workshop is from 9 a.m. to 4 p.m. both days (Saturday and Sunday), and the cost is $200. Note that accommodation (billets) is available on request. Workshop details and registration are available at drystonecanada.com, or email drystonecanada@yahoo.ca.